Dr. H.V. 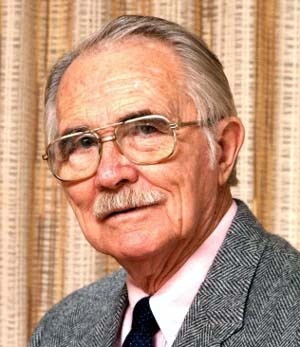 “Andy” Andersen, a Charter Member of the Gulf Coast Section of SEPM, a Past President and Honorary Member, died on June 28, 2000, at his home in Baton Rouge. He was 92 years old. Doc Andy was Professor Emeritus of the Geology and Geophysics Department of LSU, having retired in 1977. Doc Andy was born November 12, 1907 in Cumberland, Iowa; however, his family soon moved to Yuma, Colorado, and Andy grew up in this small town on the high plains of eastern Colorado. On finishing high school, where he lettered on the Yuma Cornhuskers football team, he enrolled at the University of Denver, utilizing a one-year scholarship. Unfortunately, his university training was interrupted by the harsh realities of the Great Depression and, through the late 1920s and 1930s, eking out a livelihood was more important than pursuing scholastics. During those rough years, Andy worked in a wide spectrum of employment such as draftsman for a plumbing contractor in Chicago, tipple man in a coal mine in Utah, as an interior decorator, cabinet maker, grocery clerk, and as a field supervisor of a statewide archeological investigation of Alabama. Coincident with this diverse employment he found time to attend the University of Denver, The University of Nebraska, Armor Institute of Technology, and the Chicago Institute of Technology. Andy completed his B.A. degree in Geology at Nebraska in 1940 and immediately embarked on a graduate program. However, his advanced education was once again interrupted when he returned to the Alabama Geological Survey as Director of Technical Studies in Archeological Artifacts. Much of the impetus behind these studies centered about the Tennessee Valley Authority’s plans for dams and lakes in northern Alabama and the need to perform site surveys and the removal of prehistoric artifacts. His thorough analysis of these sites along the Tennessee River documented many aspects of the prehistoric “Copena” Indian culture. His exhaustive and thoroughly professional documentation of these archeological sites provided for his nomination and entry into Sigma Xi, the prestigious academic honorary fraternity. By now “interruption” was the accepted norm in Andy’s life, so it wasn’t too surprising that World War II sidetracked his primary interest in geology and archeology once again. He enlisted in the Army Corps of Engineers and served during the war at various locations in Europe. By the time he was discharged in 1946, he had been promoted to the rank of Captain. On the day of his release from active duty he drove from Birmingham to Tuscaloosa to explore the possibility of finishing his doctorate at the University of Alabama. In addition to finding no offer there, he was counseled that he should pursue his Ph.D. at one of the larger universities up east. Undaunted, Andy pressed on to Baton Rouge for an interview at LSU where he was met by the now legendary Harold Norman Fisk. Impressed with Andy’s record of achievements, Fisk immediately knew he wanted Andersen to enroll in the doctorate program; however, Andy needed an assistantship. With this requirement exposed, Fisk called in Dr. H. V. Howe and asked Heinie if he could offer Andy an assistantship. Without hesitation Howe agreed. Dr. Howe’s authoritative knowledge of formaminifera and ostracodes influenced Andy towards the discipline of micropaleontology, a natural transition from his studies in vertebrate paleontology while at the University of Nebraska. Upon receiving his Ph.D. Andy thought he was now prepared to go to work in the petroleum industry, but when he asked Doc Howe for a recommendation, Heinie refused. Howe stated that Andy did not know enough about the geology of the region and that he should remain at the university to teach geology and micropaleontology. It was obvious that Doc Howe realized Andy’s potential of becoming an exceptional educator. Before he could settle into his faculty duties his career was again interrupted in 1950. With the outbreak of the Korean Conflict he was recalled to active duty in the Corps of Engineers. When he reported in at Fort Belvoir, the personnel officer, on discovering that Andy had a Ph.D. in geology, stated that he had a “tailor-made” assignment for him. For the next two years he was attached to the Engineers Training Publications Department where he finished compiling and wrote a technical manual on geology. TM5-545, “Geology and Its Military Application” was issued in August, 1952, and was used by the Corps of Engineers for years. Also, a prominent West Coast university used this manual in their introductory geology courses for some time. On resuming his faculty position at LSU, Andy’s recent involvement with basic geology renewed his interest in teaching introductory courses in physical and historical geology. For over a twenty-year period he taught at least one section each semester. A reasonable estimate would be that over 4,500 freshmen had their introduction to the science of geology under his instruction. Doc Andy’s greatest contribution to Gulf Coast geology and to the petroleum industry was in his exceptional training of a significant number of the micropaleontologists employed in the Gulf Coast region. Anyone who took Andy’s Geology 101 course will immediately recall the prolific “mudlump fauna” that provided specimens for the initial study of morphology and taxonomy. And, who could ever forget those ‘weird’ specimens he would include in his examination slides! Nevertheless, when a student had successfully completed a year of foram micropaleontology under Doc Andy’s careful instruction, he or she was well equipped to accept the rigors of oil company paleo work. Beginning in the early 1950s Andy initiated a summer course for graduate students in field mapping in Sabine Parish. His instruction included all the essential observations needed to make a creditable geologic map in a typical Gulf Coast area. Particular attention to changes in vegetation type, soil characteristics, as well as the fine points of “creek-ology” were stressed. Being in the field with him was a young geologist’s high point, as Doc Andy’s keen observations were always carefully explained and dutifully noted. His fieldwork and that of his students ultimately culminated in the publication of Louisiana Geological Survey Bulletin No. 34 in 1960. When most of Sabine Parish had been sufficiently mapped, Andy extended his field studies into neighboring Natchitoches. He worked on the surface and subsurface geological aspects of this parish for many years and submitted the final manuscript for publication in 1986. “The Geology of Natchitoches Parish” was finally published as Louisiana Geological Survey Bulletin No. 44 in 1993. As a distinction, it was the first Louisiana Survey Bulletin to be published in the new larger format. Doc Andy was one of only four American scientists invited to attend the 14th Annual Micropaleontological Colloquium in Bucharest, Romania, in September, 1975. This meeting provided the opportunity to visit with Dr. Thodor Negu of the University of Bucharest who, in the mid-1960s, was a visiting professor of micropaleontology at LSU. Many field excursions were associated with the colloquium and Andy sampled a significant number of European type-locality sections for the LSU museum collection, including outcrops in the Paris Basin originally described by Alcide d’Orbigny in 1826. Although Andy maintained a heavy teaching schedule in the classroom and in the field, he published more than 20 technical papers. His professional activities include being a Charter Member of the Gulf Coast Section of SEPM and serving the Section as President in 1962. In recognition of the fact that he trained so many of the economic paleontologists working in the Gulf Coast, the Section bestowed Andy with Honorary Membership in 1975. He was also a member of Sigma Gamma Epsilon, Phi Kappa Phi, American Association of Petroleum Geologists, Geological Society of America, and the Paleontological Society. After a long and distinguished teaching career spanning thirty years on the Geology faculty, Doc Andy retired in August 1977. As his retirement date grew near, he requested no ‘official’ function be held in his behalf. After discussions between the Department Chairman and the Executive Council of the LSU Geology Alumni Association, a decision was reached that an appropriate gift would be a new research microscope for his continuing studies of Gulf Coast Tertiary foraminifera. The response by the alumni to the appeal was overwhelming. Not only were funds received for the microscope and accessory lenses, but also a monetary gift could be made as well. Over one hundred fifty former students responded — many sending vignettes of old classroom activities. This was a clear manifestation of the high esteem held by so many ex-students for Doc Andy. The formal presentation was made on March 10, 1978, in the same laboratory where he taught his micropaleontology courses. After his retirement from the university in 1977, Doc Andy was more involved than ever in geologic and paleontologic activities. After spending some time putting the finishing touches on his report of Natchitoches Parish, he hung out his shingle as a consulting geologist and was immediately successful as an exploration consultant. After 30 years of training, even Doc Howe would agree that he was now ready for the oil patch. In between consulting work, Andy spent time in his paleontology laboratory working on Tertiary microfossils. In 1983 while trying to collect topotypes of Quinqueoculina tubercalata from the Moody Branch Formation, he noted that the tubercles or knobs, described as being unique to this species, were not unique. This discovery intrigued him so much that he continued his study of related miliolid species. The results of his research unequivocally demanded an emendation of the superfamily Miliolacea to accommodate genera with calcareous perforate chamber walls. The results of this research were published in the Tulane Studies in Geology and Paleontology in October, 1984. Following its publication, Doc Andy mailed a copy to everyone who contributed to his ‘retirement’ microscope. In 1988 he published a second research paper in the Tulane Studies which discussed aspects of and made comparisons of Gulf Coastal Plain miliolid species with those of selected European localities. In 1997 at the GCAGS convention in New Orleans, he presented a poster paper entitled “Gulf Coastal Plain Marker Fossils in the Revised Miliolidae.” This paper distilled his fourteen years of research on this group of microfossils. Much of the information in this memorial originally appeared in the 1986 GCAGS Transactions volume that was dedicated to him. Many times he expressed his desire that it be used as his obituary. During his long and active life, Dr. Harold V. “Andy” Andersen made many contributions to the knowledge of Gulf Coast geology and paleontology through his research and teaching. He was an extremely warm and friendly individual and kept in contact with many of his former students. Although thrice married, Andy had no children of his own. He often said it was his students at LSU that kept him young, as they changed with the times, so did he. After his retirement he maintained a close relationship with the department.